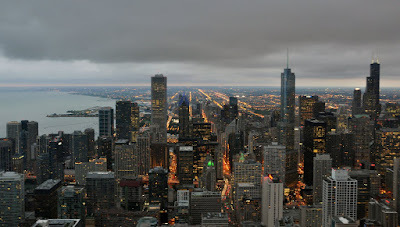 The Chicago skyline viewed from Lake Michigan (the Willis Tower, the tallest in Chicago is to the left and obscured by low cloud). The Capitol Limited links Washington DC with Chicago each day. Boarding our first Amtrak Superliner at Pittsburgh. Our stop in Pittsburgh was purely functional and I felt a little embarrassed when people asked how long we were staying and what our plans were- 'About 3 hours, we've got time for dinner.' 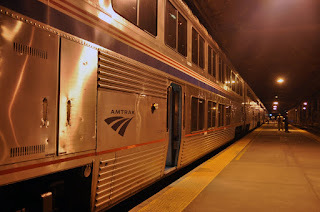 The Pennsylvanian had dropped us off shortly before 9pm and our onward connection about the Capitol Limited (which as the names suggests originates in Washington DC) was at one minute to midnight. Not really sure where to head for dinner we accost a local who seems to know where he is going- indeed he is able to point us in the right direction to reach some restaurants and after a while of aimless wanderings we sit ourselves down behind the bar at a burger restaurant only to find our local two seats down behind the same bar- 'this is a good place'. He is right as it turns out and we enjoy a very nice meal washed down with a pint or two of American 'hard cider.' Besides football, a subject on which i probably have far less knowledge even than the average American there are several other hot topics to discuss with our friendly barmaid Ashley; the UK 'Brexit', the US election and possible presidency of Donald Trump and of course a few lighter topics also 'why is a dime a smaller coin than a five cent piece?' When it came to desert Ashley was quick to recommend the pumpkin cheesecake. Now I like cheesecake but I wasn't convinced 'no, really, it's good. If you don't like it I'll eat it ' she said with a smile. It was alright- but I don't think I'm yet converted, or particularly likely to order it again. We regrettably order our bill as one of the managers appears with his head in a bag of mint 'mmm, fresh mint- the best part of the job'. I point out that a couple of our drinks are missing from the bill but Ashley is well aware so we don't press the point any further! We leave a tip and make our way back to the station leaving our new friends to debate whether or not the mint should live in the cooler (apparently it shouldn't... but it always has). There are plenty of passengers in the waiting room for the Capitol Limited to Chicago and despite being present more than 30 minutes before departure we have apparently missed the chance to check in our bags- not a problem though as an Amtrak steward confirms that our suitcases will be fine as carry-on luggage. The train arrives a little earlier than expected and we file on for boarding. The first attendant at the Superliner door asks 'Sleeper or car?'. 'Sleeper' I reply. 'James & James?' - well it's nice to be expected! I guess there aren't too many pairs of males joining the train here tonight. refurbishment which will include long term repairs to the large skylight. Our Superliner roomette is upstairs and consists of two bunks running along the inside of the coach wall lengthways, there are another two on the other side of the train with a central corridor between. The car hosts explains the features of our cabin and that there are hot drinks and juice available at the centre of the coach with one restroom on the upper level together with three more and a shower below.. Breakfast would be served from 6am. Having secured the lower bunk with more generous proportions I decided to call it a night and after grappling with the tap (which insists on releasing a high powered jet of water which ricochets off the basin bowl) and forgetting my towel I bed down for the night. I didn't sleep as badly as I had expected as I could only remember being awake for one of our overnight stops, at Toledo, Ohio. James on the upper bunk had slept OK as well though he did complain that it was a little on the small side. We attended breakfast at around 7:30 and for the second time this trip my attempt to order French Toast was thwarted due to it's non-availability. I settled instead for omelette- with grits. I couldn't remember what grits where, though was sure I had had them once before. I still couldn't really tell you what they were except that they had the consistency of porridge and didn't look nearly as nice as James' potatoes. You live and learn. Chicago at dusk from the top of the John Hancock Centre. 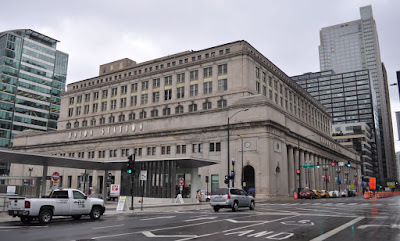 The train passes several industrial yards on its final approach to Chicago and neither theses, the dismal weather or the eventual arrival 30 minutes late into the subterranean platforms of Chicago Union seem particularly inspiring. The sun however did make an appearance before our stay was out and gave us a taste for this great city which we had really come to rather enjoy.